Description: BNSF 5031 tied down in Bristol yard next to the local switcher's power. Description: BNSF 5031 tied down as the leader of westbound NS 22A. Description: BNSF 5031 tied down as leader of NS 22A at Bristol Yard. 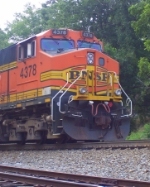 Description: Close-up of BNSF 5031 at Bristol Yard. Description: The conductor on 111 aligns the train with CNW 8646 leading into the yard. Description: NS 111 rolls into Bristol Yard with one of two unpatched CNW units, 8646, leading. Description: The CNW 8646 rolls past another NS motor as it goes into Bristol Yard. Description: One of the coolest things I've ever seen in Bristol, 8646 was leading NS 111. Description: This was the leader on NS 236, the picture is very out of focus. Description: A look at the H3 BNSF 7788. Description: UP 9177 needs some paint. Description: A beat up warbonnet was tied down on an empty NS coal train. Description: NS 911 tied down in a bad spot so I took a picture from a moving car which expains the stupid guard rail. Description: Waiting on the arrival of an eastbound. Description: NS 8778 in the freezing rain. Description: Check out those muddy trucks. Description: BNSF 610 is one of the best looking warbonnets I have seen. Description: NS 8325 awating a fresh crew on a sunny Friday. The second unit is NS 2689 a SD70M-2. Description: An inceasingly rare C39-8 is seen here on NS 111. Description: Notice the unit is smoking while it's idling. Taken from road adjacent to yard which is where that bar comes from. Description: UP 9457 tied down waiting for a derailment to be cleaned up further east. Description: A western visitor from BNSF. Description: Unpatched BNSF with some swapped side panels. Description: A look into the sun of an all-BNSF lashup on NS M6T. Description: NS M6T pulling away from the yard office. Description: Crossing over Old Abingdon Highway. Description: Southbound coal train approaching Erwin yard. Description: Lite power at NS Bristol Yard. Description: Lite power at NS Bristol Yard, that's the Bristol sign and Bristol, TN in the background. Description: Tied down at NS Bristol Yard in the morning. Description: This shot was mostly luck and good timing. That's NS 23G facing the camera and NS 787 facing west. Taken from a moving vehicle. Description: A seasoned vet idles with a young GE. Description: Ex Conrail 4 axle GE. Description: H3 leader tied down in the yard. Description: Rare to find two trains going the same direction tied down on the main and the siding. Description: NS 37Q tied down in the yard. 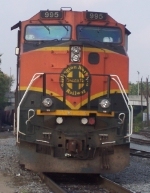 Description: Rare BNSF B40-8 in VA. Description: Trailing unit on NS Q87, most of the train is in Virginia.